In March 2017, Josh attended the EGX Rezzed convention to share our story with other indies; specifically the story of War for the Overworld’s difficult development cycle and troubled release. He talked about how we used solid communication to stabilise the ship in the face of massive community backlash, and how we went on to build WFTO into a game that is now considered one of the best in its genre. You can view the talk below, and grab a copy of the slides here. This blog post will look in more detail at these issues, which will hopefully give you a better understanding of how to communicate with your community – especially if things go wrong with your game. When developing War for the Overworld we ran into no shortage of trials and tribulations. These were borne from a number of factors, such as our inexperience, geographical distance, and lack of resources. 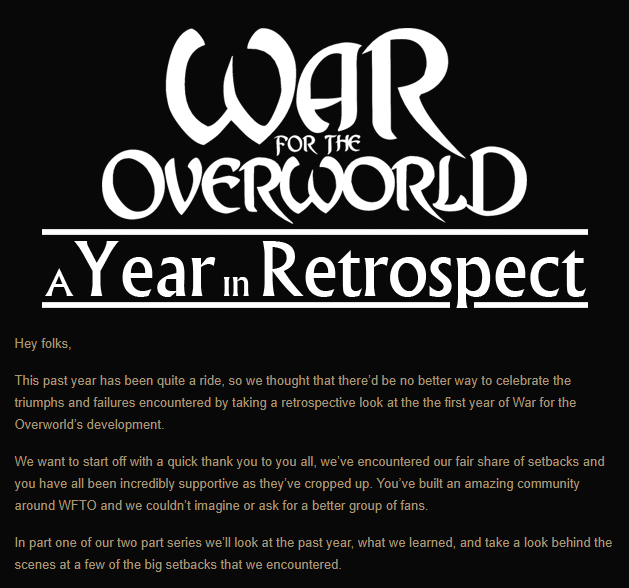 This all came to a head upon WFTO’s release from Early Access in April 2015, with the game not finished to the standards we expected from ourselves. Lee is our resident Community Manager and Zen Guru. You’ll often find him floating around the forums with the best interests of our fans in one hand, and an energy drink in the other. If you’ve been on our channels, you’ve read his sincere words. Every community manager’s worst nightmare condensed into a single image! We faced a wave of negative feedback that if left unchecked would have destroyed any chance we had to repair the game and make it into the title we always knew it could be. But two years down the line and we’re still here, still developing the game we love, and WFTO has an impressive long tail for a game that should have crashed and burned. 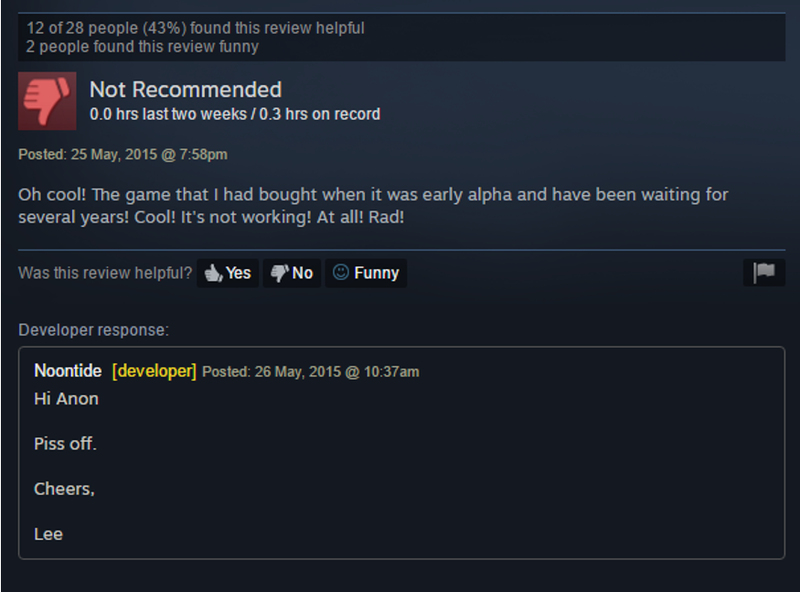 We now hold an overall steam review score of 78%, which is increasing month on month. How did we get here? With solid, honest and transparent communication! Along with, obviously, continuing to improve the game. But before we dive into the meat of why communication is so important to developers, I’d like to take a moment and provide some more context for our story. You can feel free to skip the next section if you want to get straight to the strategy. WFTO launched in April 2015, twenty months later than the originally planned! The reception of the game was extremely grim. The necessity of release had left us little time to polish and fix it up to the standard we would have liked. We knew immediately that something had to be done. To save ourselves and give us the opportunity to deliver what we knew our fans wanted, we decided to double down on our policy of solid communication – something we’d been doing from the very beginning. By sticking to what had made us special to our fans, it enabled us to survive the aftermath of our troubled launch. Much as possible – Engage with your customers whenever and wherever possible, even if it’s outside your chosen mediums. Seek out your users! Often as possible – Keep the pace up with your communication and make sure that information is disseminated regularly throughout your community. Honestly as possible – Lies will always be uncovered, and will make you appear ten times worse. Share as much of the truth as you reasonably can. Sincerely as possible – Sincerity will humanise your brand and will allow you to present yourself as an organisation that truly cares. Nicely as possible – It’s important you always present yourself in a polite and clear manner. Always be the good guy as much as you can. Sticking to these tenets will help to redefine your company in the eyes of your customers. By treating them with respect and humanising your organisation, you’ll enable them to share in your journey, and to invest in your company and you as individuals. The “Angry Mob” – When faced with hundreds, thousands, or even tens of thousands of upset users, it can be difficult to wade into the negativity. It’s important to separate yourself from the situation and realise your customers aren’t out to get you; they’re simply after a good game and that’s something anyone can appreciate. No time / resources – We’re fortunate enough to be in the position to employ someone full time to manage our community (yours truly). For smaller teams it may not seem possible with the time and resources you have to hand. In this case it’s important to understand that any communication is better than nothing. Find the time to make a statement at least once a week to let your community know what’s happening. Bad at communicating – You may have this opinion of yourself that you’re a bad communicator. Again, this doesn’t matter as much as you might think; simply stay honest and to the facts. This isn’t a marketing exercise – you’re simply trying to keep your fans informed. Make things worse? – You may feel you’ll make things worse by talking, but this is almost never going to be the case. If you’re nice and honest there’s very little that can go wrong. Although it can be challenging to face these issues you’ll find that the benefits you gain outweigh the costs in most scenarios. Let your passion drive your will to communicate, and fans will draw that in! Why Is Frequency of Communication Important? 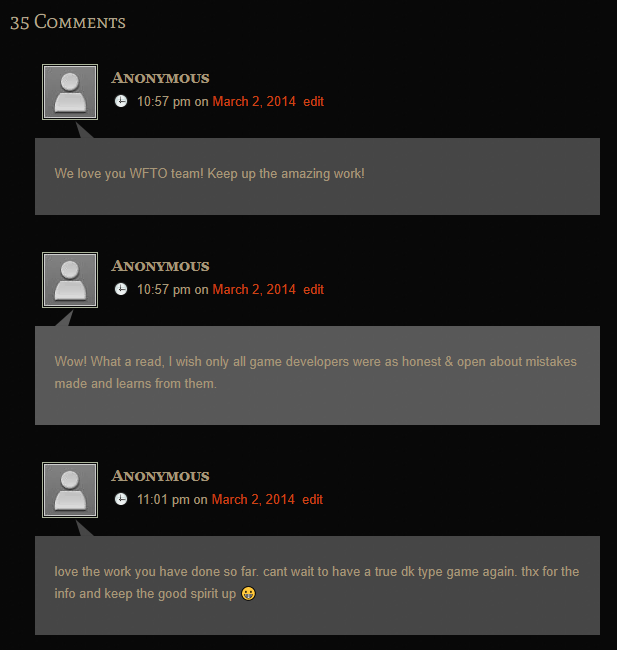 Let’s explore a scenario: a game breaking bug has been uncovered in your game and people are talking about it. There are hundreds of complaints on the forums and your review score is in the tank. Hopefully you’re aware of the situation and you’re working on a fix. However, your community is not aware of this simple fact, and in the absence of any communication will take it upon themselves to fill in the blanks. Knowing what we know about the industry at large, as consumers the assumption will not be a positive one. Often when a developer ceases communication it means a solution will not be delivered. Players will naturally assume the worst, so it’s in your best interests that they don’t fill in those gaps. Wait too long and the damage is done. Ideally in this scenario your first response should be: “We’re aware of the situation and working on a fix.” This will assure your customers that you’re not abandoning them, and fixes are in the works. If you can, try to give a rough timeline as well. Make sure this message will reach your customers wherever they are. Use the tools available to spread the message far and wide: social media, announcements, stickied threads, blog posts, vlogs. Whatever is necessary just share the information in the quickest manner possible. Expanding this scenario into a much larger disaster like our launch, you need to further this by keeping your players engaged; the more you can communicate the better. 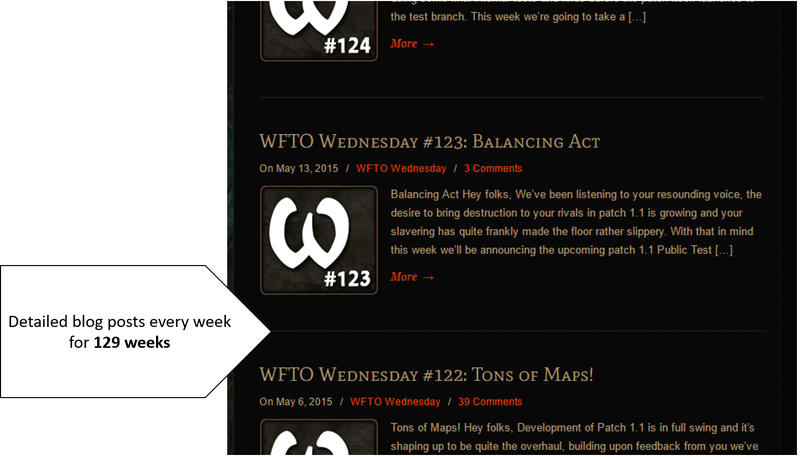 As we said previously, we used our weekly War for the Overworld Wednesday blog post to disseminate information each week. We kept this running post development as a tool for us to reach our core fans with critical information, which they would then disseminate amongst our further community. This helped save us time and energy, which was vital in our chaotic post-launch period. One of the cornerstones of our philosophy is to be sincere and honest in all our communications, as part of humanising our brand. But what do we mean by communicating honestly? Own your mistakes – Take ownership of the mistakes that led you to this situation. What needs to be addressed? Own your problems – Recognise and acknowledge the problems that contributed, and discuss how you’ll deal with them. The truth will humanise you – To err is human and to truthfully communicate your failings is to become human in the eyes of others. In the eyes of your consumers you then become a recognisable being, rather than an entity that has simply stolen their money. If you’ve released in a state like WFTO did then this factor in your communication is very important. As it stands, all your players will only be seeing the very tip of the developmental iceberg, not all the issues that lead up to it. By taking ownership of these issues and honestly communicating to your customers, you’ll be humanised, making it much harder for them to simply lay abuse on you. Customers cannot empathise with faceless organisations, so share with them the human story! Never underestimate the value in an honest apology. This truly illustrates why it’s so important that we as developers should be breaking the mould when it comes to this. Customers these days feel as though every word from a company’s mouth is a lie, covered in good-looking but foul-tasting PR glitter. If you talk to your customers recognising that they’re people just like you and I, then you can bet they will be fans for life! It shouldn’t be much of a surprise that being nice is the best way to get someone on your side. Yet so many developers seem to fail in this regard, taking to their forums to flame their user base. This is an approach which benefits no one. If you really want to get people on your side, you just have to remember that no matter how harsh a player is being, they are likely only after the same thing you are: a great game. Recognise their motivations and you’ll understand why they let the frustration flow in their messages. Always be polite in your approach and you’ll get much further! Remember that if a person is indifferent they’ll simply refund, ignore, or pass on the game. 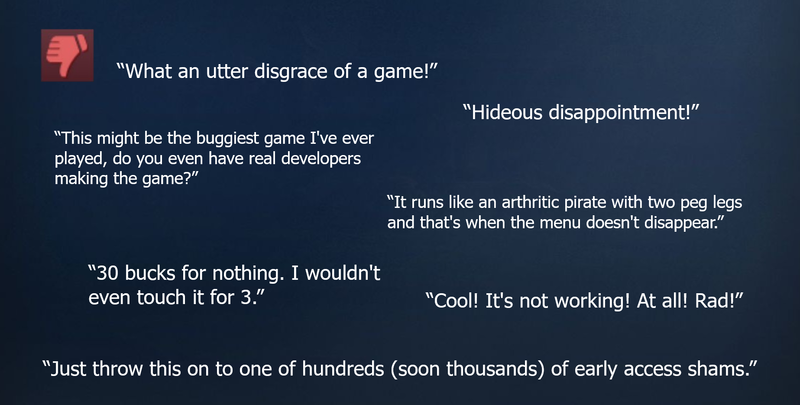 But someone who takes the time to type a paragraph about how bad the game is and how much the developer has failed clearly has some sort of passion for the title. If you can harness this passion you can create incredible advocates of your team – provided you can convert their anger into a positive force. People will appreciate you taking the effort to respond nicely and constructively, and many will flip their opinions. 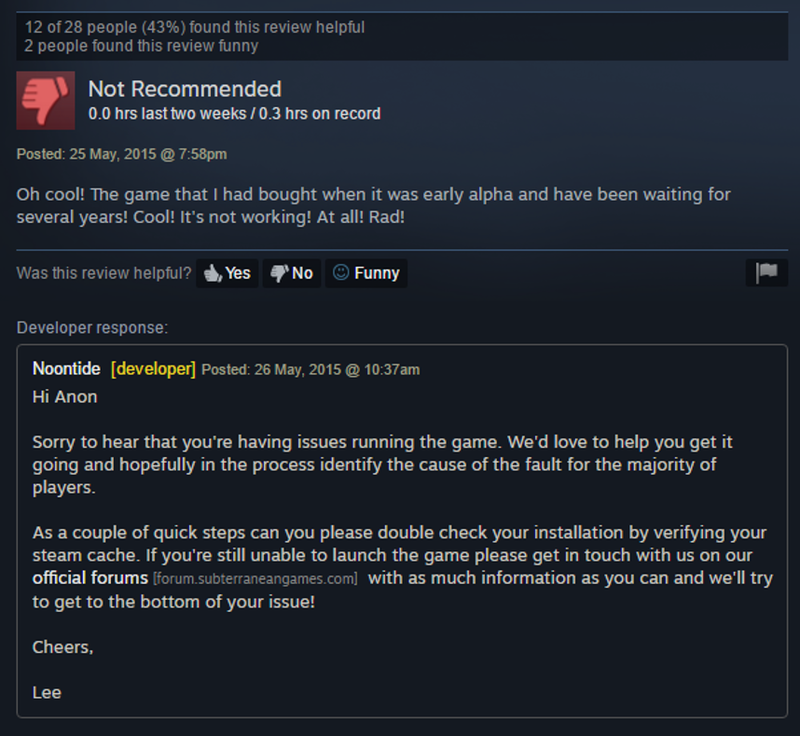 This is an incredible force when dealing with Steam reviews. Flipping a few reviews can help keep your game afloat. What’s even better is that this niceness will often snowball. By being nice to one user, that user may share their experience with others and be nice to them whilst sharing your message. As you’re fixing the game up it’s always worth reaching out to players wherever you can find them, especially if they have been disenfranchised by the state of the game as it was. Seek them out on platforms that matter to them. Social media is great, but don’t forget that people may talk about your game on articles from the press as well. There are tools to help you with this – Google Alerts or Twitter searches for example. Make an effort to find your users where they are and they’ll appreciate you all the more. 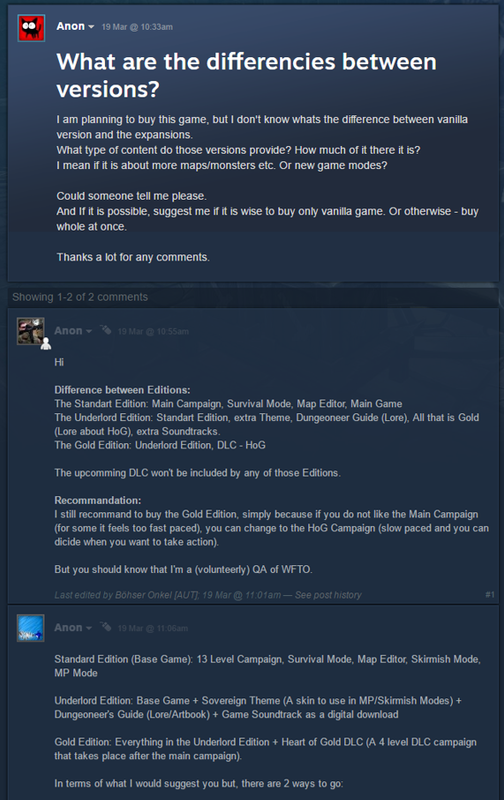 If you’re a PC developer then embrace the Steam forums especially. It’s likely that this will be the path of least resistance for players to discuss your game. While many developers believe it to be a cesspit, this is usually because they don’t spend the time to manage it appropriately. A good example of this is that after nearly four years on Steam we have only banned five people from our Steam forums. And even then it’s usually for constantly flaming other users, and never for simply voicing their discontent with us (plus that’s a sure-fire track to getting really bad press). If you foster your forums appropriately it will become a nice place without much input required from you. Though don’t be afraid to drop in and issue a short warning to encourage constructive discussion. If you do everything right then you’re most likely going to see that your most dedicated players take up the mantle for you, and help do your job with regards to spreading communication. You’ll find them answering questions, advertising the game to others and generally helping others. Reward your early adopters in whatever manner is feasible, whether this be a free or discounted DLC, exclusive skins, etc. Players won’t be happy if your game has launched in a poor state – they paid £30 for it and then a few months later someone could buy a much more stable version and a DLC for the same price. For example, we gave away our first expansion to anyone who purchased the game within or before the first month of release. This went a long way towards mending relations and gave people a reason to jump back in after we’d fixed up the game a lot. You can further enhance this by embracing your players and community. Identify your super fans and bring them into your inner circle. Giving them a platform to directly reach you will make it easier for them to spread your message. For us this is in the form of a group of users we call the Foundry. They’re on our Slack channel, can access us directly, have access to internal builds, and can help provide feedback. Most importantly they act as an extension of my own duties as community manager (who was also hired from the community – originally I was a Kickstarter backer!). They provide an unprecedented scalability to our communications, always being very active and engaged. Once you have your super advocates they’ll help you with all sorts. Be sure to value them dearly! Patch 1.1 – Primarily a massive bugfix patch which followed on from 25 minor patches, and introduced a number of missing features such as 4-player multiplayer. Patch 1.2 – Huge balance patch which aimed to rebalance the game, which didn’t get much balance at launch. Patch 1.3 – Introduced a Map Editor and Steam Workshop support to aid the long-term health of the game. Patch 1.4 & Heart of Gold – First expansion, released for free to early adopters, including a new campaign informed heavily by community feedback. Hugely well received. Patch 1.5 & Crucible – Free survival game mode. 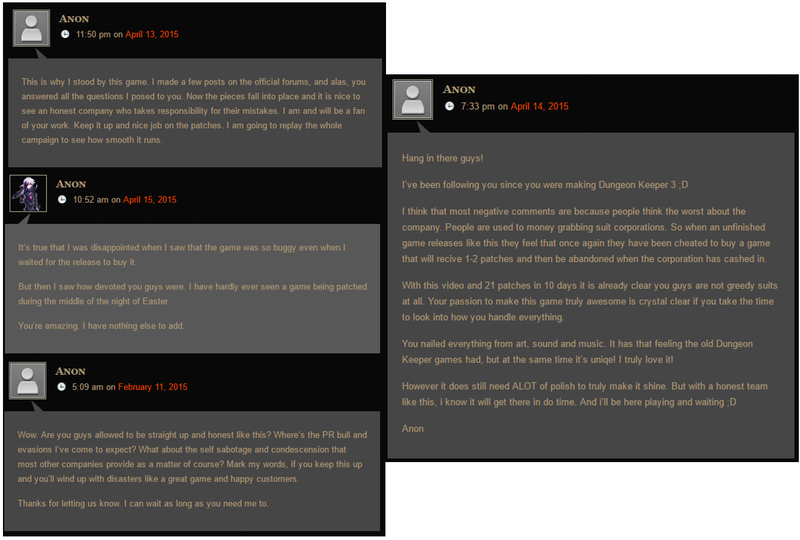 Patch 1.6 & My Pet Dungeon – DLC developed in response to huge community demand. Reach out – Aim to improve your review score by reaching out to negative reviews. Increase your exposure by approaching influencers as soon as you think the game is worth giving another look. Sell beyond Steam – Look into other online stores. These sites can offer something of a mini launch, meaning they’ll promote your game, put it on sale, etc. Make good use of promotions – Use sales and promotions intelligently to get the most out of them. Try to avoid deep discounts where possible and don’t overdo the sales. Build a plan of your discount strategy for a few years. Don’t alienate your existing customers, and be wary of bundles as they may give away more units than they’re worth. They certainly have their place but only as part of a solid sales strategy. Remember that you’re in this for the long haul and you need to ensure that your business strategy supports you appropriately. Don’t just blow all your discounts at once! I didn’t see any comments directly here so I thought I’d be the first to leave one. I was one of the earlier adopters when you guys went Early Access on Steam and the game was in pretty poor shape at the time so I played maybe an hour or so before I refunded it and planned to leave it behind forever. I was really looking forward to a good successor to Dungeon Keeper and thought my search would simply have to continue. But after hearing about the dev team’s constant and devoted efforts to shape up the game to live up to both the players and the dev team’s aspirations, I came back, bought the Gold Edition, and enjoyed the crap out of the new WFTO. I’m planning on picking up your other DLC soon after I work my way through all the content I bought first. Just wanted to say great job. Having seen the difference between the Early Access drop and the shiny, improved WFTO, the difference is mind blowing and you guys deserve all the praise for your hard work. It can’t have been easy but I’m glad that you came this far. Here’s to hoping your current and future projects all go as well. Cheers! We want nothing more than for our fans to enjoy the game and it’s always been tough on us to have the state of the game from 2015 hanging over our heads. But hearing this from you is like a breath of fresh air. 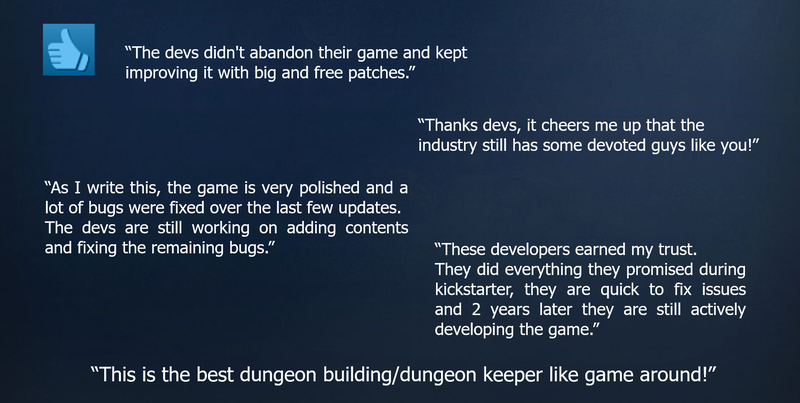 In the darkest corners of the subterranean realm, a developer named Bullfrog created Dungeon Keeper. It started a genre that stood apart from sims, action, platformers, first person shooters, and real time strategy games such as Warcraft. This game was a legend by itself and had a pretty good sequel, but the developer burned down, fell over, and sank into the swamp. From the ashes of those islands, rose the unbridled spirit of the game in a kickstarter that I was delighted to join. The brainchild of you wonderful developers had to stumble, it had to get sick, and it had to fall down before it could start to learn how to fly. Now, I am proud of the game you continue to develop and the work you have put in to make something that exceeds what Bullfrog started with. Cheers to you people. You make evil so very very good.